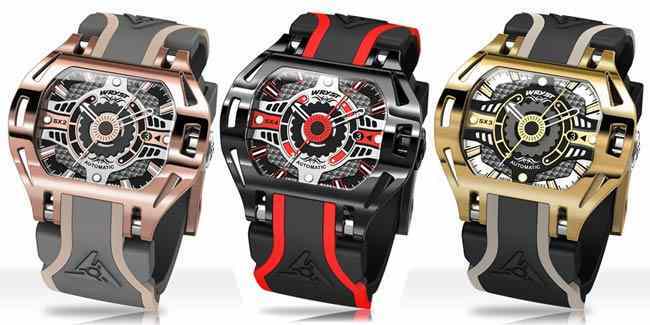 Racing automatic watch Wryst SX4 inspired by Motorsports and Racing Sports. This Racer SX4 is simply the head-turner you have been waiting for! 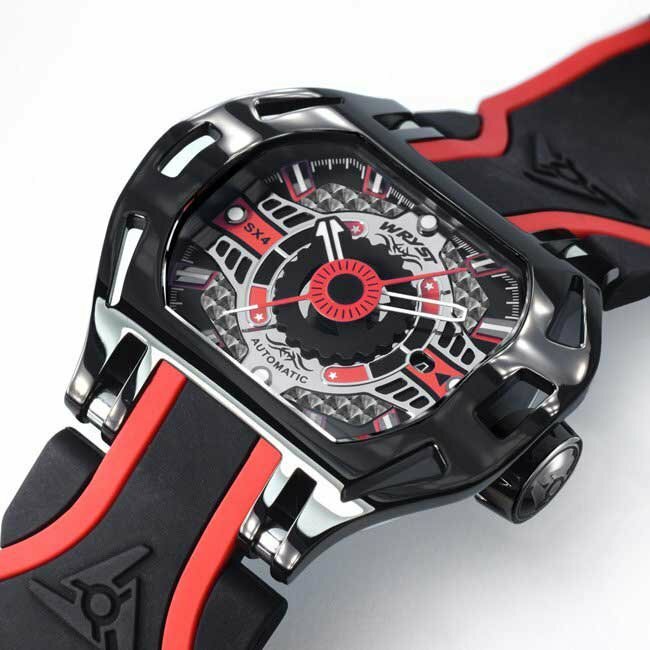 An automatic watch for racing that is bold, brutal and unique. Furthermore, it is also highly collectible and durable. Twin brother of the ETA 2824, the Swiss mechanical Sellita SW200 is a delight to look at with a large sweeping second hand. 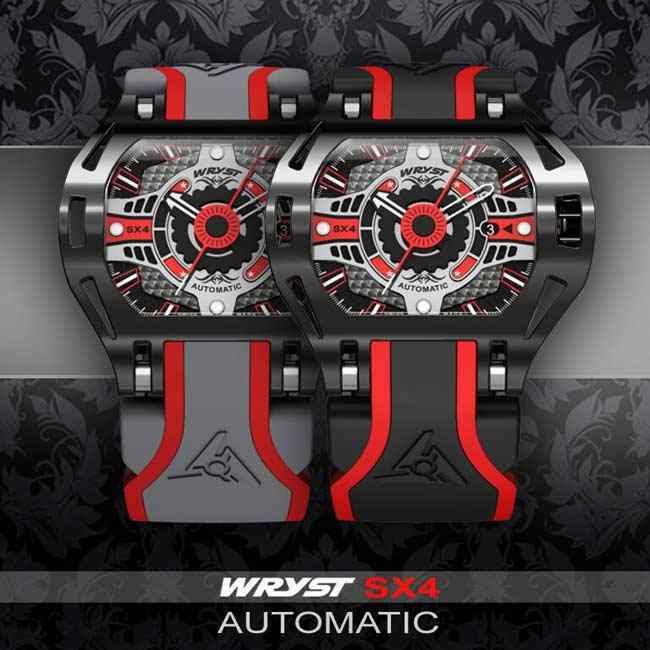 Become one of the 75 lucky ones who will ever wear this unique and collectible Wryst SX4 racing automatic watch. The Racer SX4 benefit of polished black DLC coating, the most scratch-resistant available in the watch industry. The casing, black signed crown, and black signed 25mm size signed buckles benefit of this coating with a shiny polished finish. 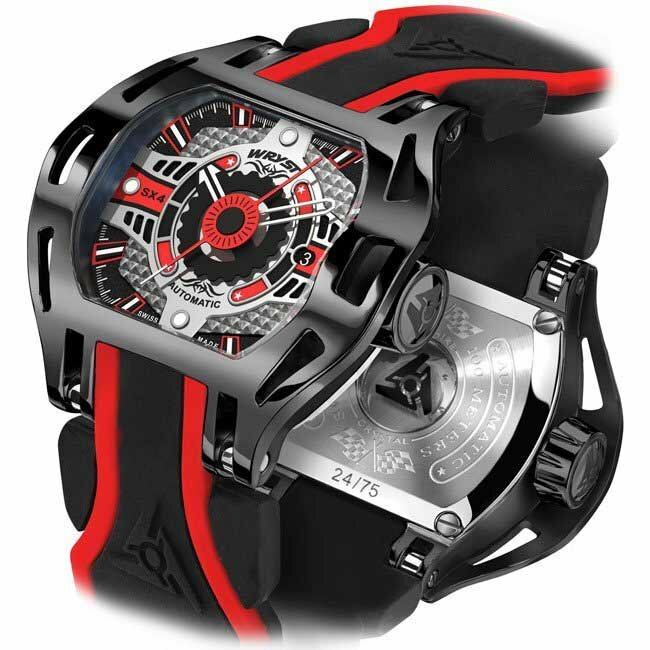 This makes the Wryst Racer SX4 one of the most desirable automatic watch ever produced by the Swiss watch brand. Up your game with the right gear. The Wryst SX4 design is 100% inspired by motorsports & racing sports. The case has a uniquely aggressive and brutal design. Some compare it to racing cars and supercars body shape or engine parts. Who else will wear this SX4 racing automatic watch around the track if it is not you? Showcase a head turner, just as much as your car/motorbike or even your last lap time. 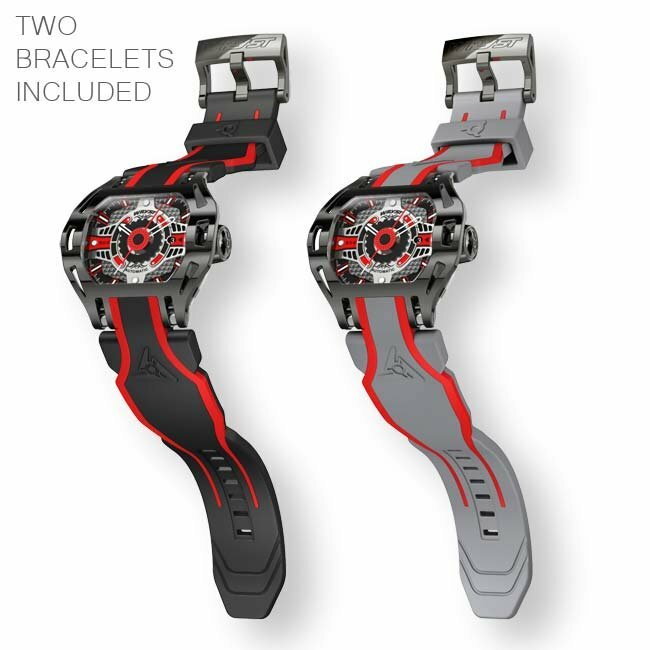 With the Wryst Racer SX4 wear "amazing" on your wrist. The color combination and built of the dial are even more pronounced on this automatic racing timepiece SX4. Strong of a passion for everything that goes fast on the track. Motorbikes, superbikes, side-cars, racing cars, supercars and more, the collection Racer show to be strongly influenced. The 50mm casing size is also bold and masculine, just like you are. Wryst also makes the most of an exclusive collaboration with the world's fastest and most dangerous race, the Isle of Man TT. 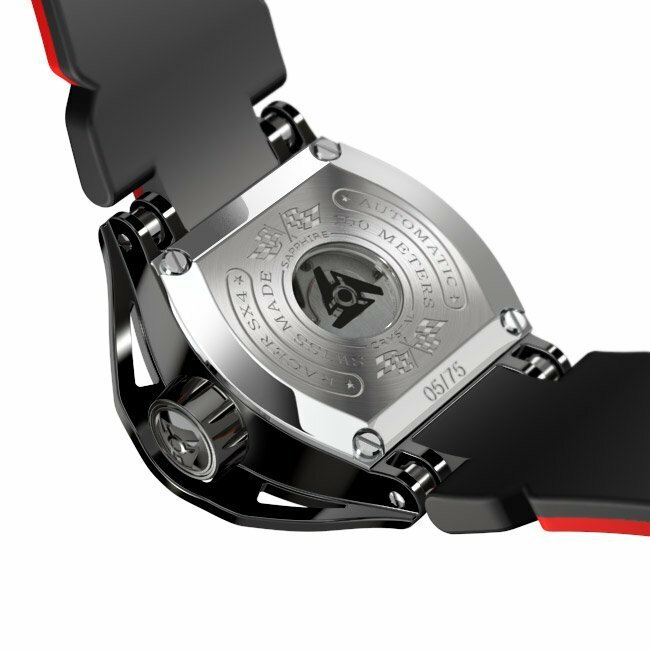 Through the case back you can admire rotation movements of the Sellita SW200 rotor. This automatic movement, Swiss clone of the ETA2824, is the world's most reliable three hands/date ever made. Therefore the SX4 holds the best, more accurate and most durable gear and eventually looks the part. The back also is engraved with style. Fortunately, only 75 pieces of this limited edition will ever be produced, keeping is highly exclusive and for collectors. 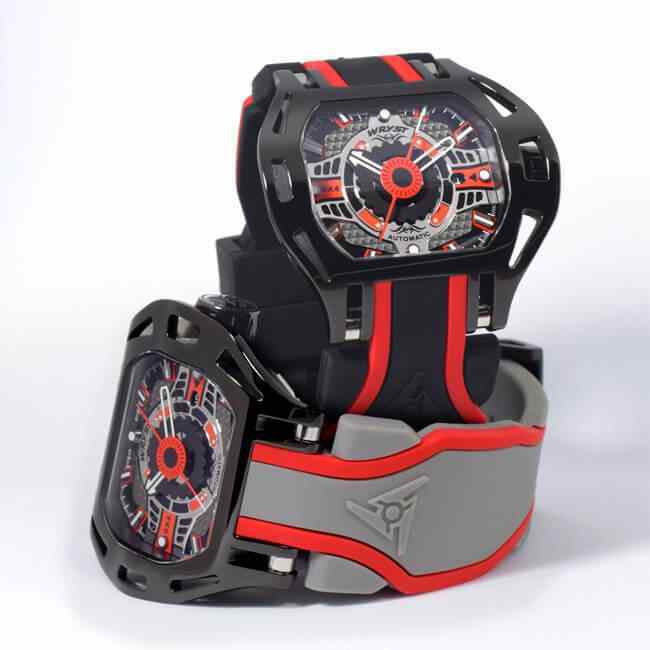 Color-wise, well it had to be black, shiny steel and some red details on the dial, and also on the bracelets. The interchangeable 30mm large quality silicone band reduces width at 25mm near the black DLC buckle. Choose either the double injection matt black bracelet with red thin lines or the dark grey one. 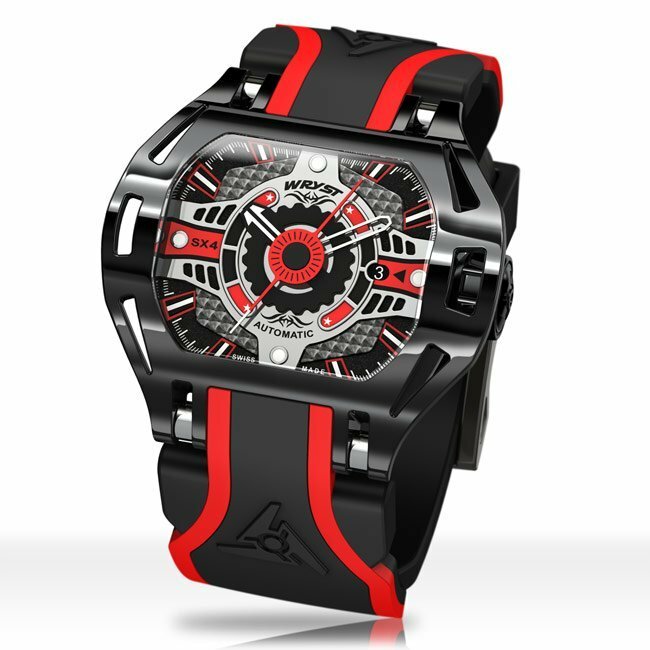 The Racer SX4 showcase a dial that is unique and most inspired by mechanical racing engines. On the left and right side, the cuts are the reminder of V6 engines. The hour hand has the shape of engine gearing with a bright luminous minute hand rotating above it. A large ever-evolving sweeping second-hand takes all the dial. Four details are finished with "Côte de Genève" (Geneva stripes) for a further shiny and sporty feel. Wryst opted for the H4 hand fitting version of this exceptional automatic movement. This gives the three-level details volume and depth to the face of the watch. 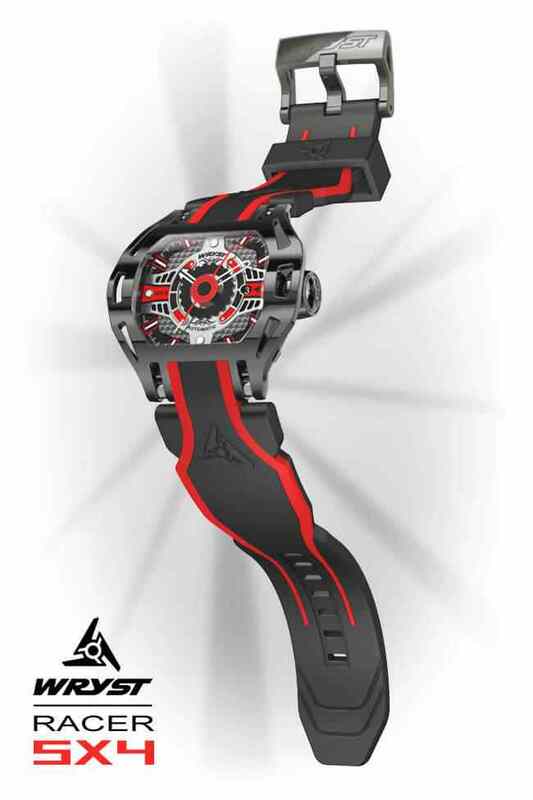 I am impressed, the black watch with the red accents is very impressive. Also the stainless steel model with the black strap hits the mark for "disruptive and exclusive" very nicely. I really like your professional and courteous engagement. Very respectfully, Jimmy the watch guy. Thank you so much Wryst I love my new Racer SX4...! Good customer service too which was helpful. Highly recommended. Ultra modern watch.